The school holiday began! For that well-deserved break from scheduled lessons and hard work, our kids do deserve more time to themselves. In that window time of theirs, how about planning a daily bonding activity that will be easy and least time consuming so everyone in the family can be involved? Whether we are the working or non working parents, let's not forget our parental roles in that extra time of theirs this holiday. I've to confess that on regular days, we are often too focused on routines and bedtime madness, we hardly find quality time to bond daily, except on weekends. Honesty at its best. We could try toilet rolls as pins for bowling or paper plates stuck on a stick for ping pong balloon. Let the sporty imagination run! 10, 100 or 1000 pieces! Hide a couple of items in safe places and get the kids to find. If they are near it, hint hot, if far, hint cold or very cold. Or perhaps, come up with a list of things to hunt for. A house, a castle, an animal or a car. We pick 2 and they pick 4. Pretty sure there will be good shows in June. Maybe an owl, robot, car or castle. Complete with paint or coloured papers. Massage and wash each others feet. Teach humility here. As a customer and server in a restaurant or shopping in a department store. You may use sticky notes for the price tags and get the cashier to do the math mentally. How about gathering little figurines, cut out windows and doors from coloured papers? Put everything except the flour and cornflour into a bowl. Gradually add these until you have the consistency of bread dough. Store in an air tight container or bag in the fridge. Find a favourite book, assign the roles and act out story from the book. Make it hilarious! There's endless fun in folding papers. Check here for origami start out. Birthday, encouragement or get well cards are great ideas. Celebrate the holiday with a plain cake from the bakery. I'm eyeing that plain chocolate cake from awfully. Get sprinkles or fruits to decorate away! Since bedtime can be delayed. We will do a midnight feast with junk or no junk food? Up to parents' discretion. One dish meal will be perfect and almost hassle free. But of course, a spread if you've got little hands to help. 19 Jun (Sun): Let's play hangman! Paper and pen. That's all we need. Which means the kids are allowed to get creative on Mum and Dad''s faces and arms! Print a couple of the family's favourite photos and scrapbook with the cut outs. Draw and cut characters from papers and stick them on! Draw a portrait of ourselves and put in the nice words that describes us. Something like this. List items to hunt for in the outdoor. Example: brown leaves, chewed leaves, stones, insects! Draw and cut out hearts, write kind note on it for everyone in the family. Decorate it colourfully! 26 Jun (Sun): It's a close to the holiday. Make a thankful jar or box. Write in things we are thankful for during this wonderful holiday. Yeap, that's our home play planner this coming holiday. It sounds reasonable to give up a tiny fraction of our daily time to our kids, doesn't it? Get the Daddy in too! ONLY.28.DAYS. The heavier activities can fall over the weekend, while the lighter activities take up less than an hour on weekdays. Get your play planner up too! And of course, to save planning time, you can use our planner too. Most Welcome! Though I'm not sure if we can follow through, but a plan is a good start. Shall update our progress through Instagram. Hopefully we can get all planned activities covered, above and beyond the daily schedule. At least, we've got today covered! I guess we are a step to getting more hugs and kisses from the kids after this holiday! There are several ways to soothe a crying baby. Upon ensuring he has been well fed and cleaned, we often have to experiment various ways of comfort. The usual we do is much of picking up the baby, to keep him in motion. As like in the womb of a busy Mum. Other checks include the gas and comfort check. Whether he needs to release Burrrpps or if his clothing and surrounding is comfortable. After the basics are checked off the list, he's often easy playing on his own till his next nap or sleep, when he'll cry for comfort again. That's when I would try to introduce sleeping aids, like toys! Not all toys, but one that produces white noise is perfect for babies. Wonder Toys sent a really cute plush to Juboy. You can call it, GGOTG (Gentle Giraffe On The Go). By cloud b, the baby sleep specialist was established with the philosophy that every baby deserves a sound night's sleep. Their products are developed in consultation with an advisory board of pediatricians and sleep specialists. So be assured by the level of research and tests behind each toy. It has developed award winning plush pals that not only soothe and relax our little darlings but are also great for snuggling and playtime. So what exactly is white noise to a baby? Or some may call it white sound, is a consistent noise that comes out evenly across all hearable frequencies. It is repetitive and unobtrusive. Examples are like the running of the fan, the rain, waves on a beach etc. White noise is soothing to a baby, as like in the womb, it drowns out other noises. Particularly newborns who have not gotten used to the outside world. It not only helps baby fall asleep easily but stay asleep longer too. GGOTG comes with 4 soothing sound options - Safari groove, jungle trails, Victoria Falls and Babbling brook, mainly for play, clam, relax and sleep. I've uploaded a video on the sounds towards the end of this post. The GGOTG is one you can use as a sleep routine in the home or on the go. 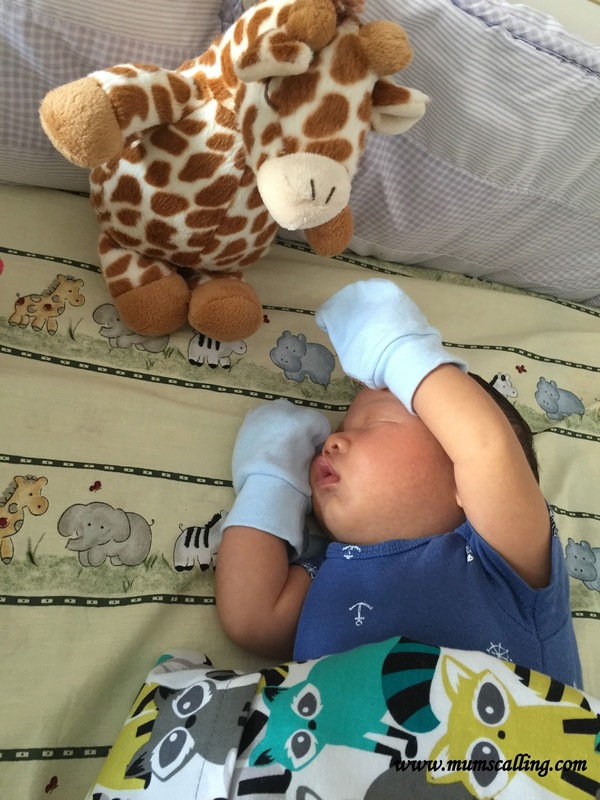 It not only soothes baby to sleep with fun jungle sounds, it's also a lovely companion and cuddly toy. Two sleep-timer options - 23 and 45 minutes. I would usually turn it off when baby sleeps deep, so it's a good function for me if I forget. Velcro tab for easy attachment to baby's stroller or the cot. Which is also one safety feature to prevent the toy from falling onto baby's face when sleeping. The velcro strap is strong and slightly adjustable in length. The Giraffe comes in 2 versions, "Regular" and "on the go". This is "on the go" version. Regular is bigger in size and has 8 sounds. Requires 2 AA batteries, which are thoughtfully included upon purchase. It is also cleverly designed such that the sound box comes separate from the cuddly. Just so the giraffe can be cleaned or washed without the electric device in. 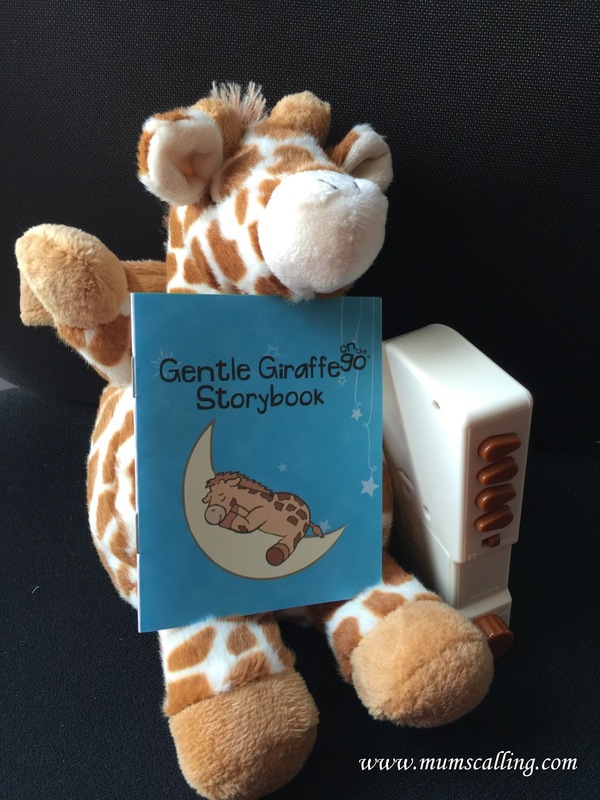 There is an insert on the back of the giraffe where the sound box can be inserted for play. And when cushioned in between, the sound does gets softer. That's when one will appreciate the dial to adjust the volume gradually low or high. That worked as the On-Off dial too. So yeap, this toy had been well thought and carefully designed for our little darlings! Other than getting the giraffe onto the cot, you may use the toy for car rides by attaching it to the car seat to calm a crying or fussy baby too. Or while changing the clothes or diapers of our baby. While this toy works wonder for most babies, I'm pretty sure it might help some grown ups cope with better sleeps too. White noise is for any ages. You may listen to the jungle theme sounds and white noise from the following video. If you've just welcomed your newborn, do give this a try! You really won't know till you try it. 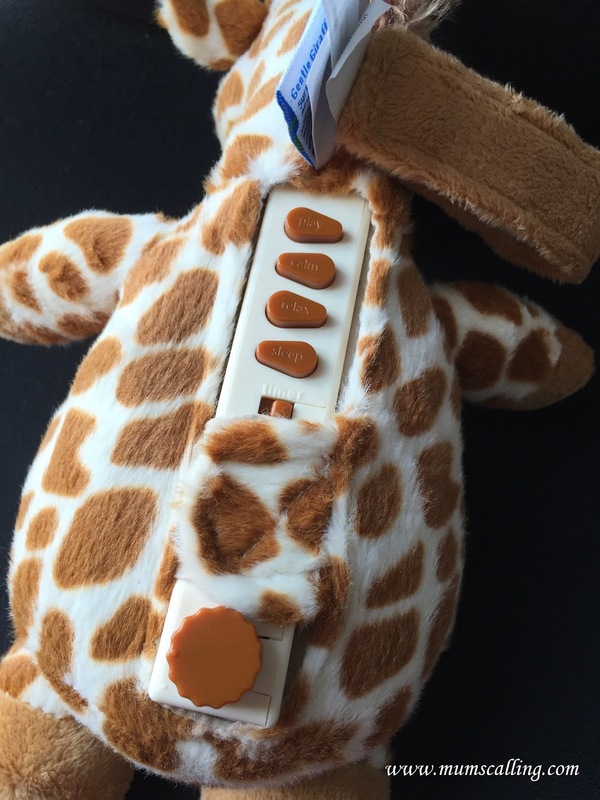 Apart from the sounds, I am loving how cute it looks just like Sophie the giraffe, the teether. Ok, I have a special love for giraffes. Wild, but tame. Wonder Toys is the sole distributor of cloud b toys. To get hold of cloud b products at a 10% discount, simply use code, 'Mumscalling10' for a 10% discount upon carting out (Code expires on 30 June 2016). Free shipping for orders above $60. This is one great toy for your newborn, as well as a wonderful gift for your friends' baby! 3. Tag 3 friends on this Facebook post, whom you think will be keen in this giveaway. This giveaway has ended. Big congrats to Maryam B! Is there a best age gap between siblings? We're into the 3rd week of welcoming our newborn, Juboy. His monicker. It's been quite a breeze this far, except for some nights when he decided to fuss after feeds and rob the peace of the light sleepers. The man and I. Being our third and having 2 kids (Ages 7 and 5) of a rather big age gap, everything seems to fall pretty well in place. Jazz and Jare are showing much affection to their little brother, and because of this gap, I find that they easily comprehend that the baby needs their Mama when he demands milk. The only case of crying gets you what you want in the house. No jealousy or rivalry. Thankful for these understanding little people. It was somewhat different years ago, when I was pregnant with Jare. A guilt bugged me and I felt bad towards Jazz for needing to divide attention with another sibling soon. She was 2 and it seemed we've not had most of her toddlers years yet. I recalled the initial weeks upon our second arrival were rough, we dealt with jealously and Jazz was throwing random tantrums that required our complicated navigation. At that tender age of 2, nothing seemed to work with reasoning. It was however, rainbow after storm and rain. The third came and I felt extremely accomplished to have seen and focused through the toddler years of Jazz and Jare. Though Jazz does require some help and attention with school work now, she is independent most times. In fact, both elders are very much independent. There are different benefits and drawbacks for having siblings spaced closely together, just as there are in siblings spaced apart. I did worry they may not be playmates the same way, the things they can or cannot do together, as well as the closeness they hold. But perhaps, I should look at this as having greater love, encouragement and help from the older siblings. We are still in the early days of adapting, and I do hope things stay as wonderful as it is. Of course, the littlest has yet to discover the pros and cons of his siblings. More squabbles or peace ahead? The days will tell. I reckon, there really isn't a perfect time to have another child, even if it means starting babyhood after a long while. The best time for one, may not be the best time for another. We all have different family dynamic. While little lives are wonderful gifts from God, we will be given the wisdom to work around our circumstances to bring forth and care for another blessing. For sure, another sibling will be the best gift for one another. Looking forward to the brighter and exciting days ahead as FIVE! Aviva Superfundae 2016 is back! I made a wish that it will make a come back, and it's here! Aviva Superfundae 2016 is back with more than 30 games and activities sprawled across The Meadow, Gardens by the Bay this June! Yay, to an exciting June holiday ahead. We know something ought to be really awesome when it's back again. This largest playdate in town is one great outdoor 'funival' for families to bond and connect through play. It will showcase 3 play elements - Connective, Active and Creative play. This is play at its best where participants are interacting with one other, honing their psychomotor skills from the outdoor quests and dashes, or unleashing their creativity with hands-on arts and crafts activities. Here's what you can expect from the five thematically-designed fun zones - Circus Centre, Speedy zone, Dream Castle, Pirate Island and Jungle World. Dream about candies falling from the sky with Mega Candy Canon. Free gummies will be blasted out of a candy canon every hour. Yes, sugar rush guaranteed! Enjoy a movie under the stars as we wind down in the evening. Challenge your inner hero at the Ninja quest obstacle course, a giant inflatable obstacle course at the Meadow. Kids zip around the skate scooters, squiggly cars and push bikes. For the Mums and Dads, challenge yourselves with kids in tow. Check out if Dad is strong enough to handle two kids at the Double Daddy Dash, or swoop Mum off her feet and dash through the Daddy Mummy Piggyback. Quench your thirst with a beer at the beer dash. And kids, the milk of course. Let imagination run wild at Kaboodle play, with large foam blocks. Budding artists can have their go with art and craft activities by Mosaic Workshop, JayJayJolly and Da Little Arts School. Get wild and wet with Nerf Super Soakers 'at Craycrayspray Water Play. Mums and Dads are welcome! It's good hint that you should bring extra clothing. Make treasure boat with origami paper and float it down the winding river. Let's see if it survives the rapids! Swing like squirrels at Squirrels and Acorns and make your way across balancing beams and swing from vine to vine while transporting goodies back to your nest. Pretty sure the monkey boy in our family can handle this well. Form a parent-child team at the Numakiki Jungle Obstacle and navigate through a super fun circuit that puts your brains and motor skills to test. And of course, for the babies and young toddlers out there, there will be a diaper change area and nursing room, as well as a toddler play room for the really young ones. An awesome Superfundae pack for children up to 12 years old. Adults will get a free beer or juice! Quite a deal, isn't it?!! Get your tickets fast! More information on Superfundae here. We were there last year, and I've to say everyone had tremendous fun! We played from bright to night, leaving only after the movie screening under that starry night. Read our fun experience here. We are excited to be grabbing our caps again for this upcoming mega outdoor play. Definitely a great opportunity to disconnect from work and gadgets, and connect with our family through games and fun activities. Outdoor play in the gardens sounds more than just perfect! This giveaway is closed. We have picked 2 winners. Congrats Xin Y and Joyce! Disclaimer: We were given tickets for the purpose of this review. Photos were taken from last year's Superfundae. Discover the unlimited possibilites with Miclik! I am a huge fan of toys that has no limit. One which allows creativity and ideas to flow in whatever directions possible, and these are just what our children of today need, and should be capable of. When Explorer Junior sent us 2 boxes of Miclik, pieces of toys that can be snapped and folded together for unlimited possibilities, the kids were exhilarated! They were ready to put their thoughts into action till they went, "what can I do Mummy?" Guess the kids are just too scheduled to what to do and what not to do. I then got my hands on it and realized it does take some thinking and strategizing on these modular. WHAT and HOW to create. Good thing, the box came with a booklet of simple instructions and ideas on what to create. Not extensive but good enough for starting out. That gave the kids direction to work on. After which, Js were able to venture more wildly with their own ideas. While Js were exploring, they not only tapped on their creative juices, but also the art of being patient. Which is much needed during the build up. The toy connectors come in 4 colours - pink, blue, yellow and green. We love how visual stimulation is cleverly considered in this toy. Creativity, imagination and happiness is colourful, isn't it? After all, children are attracted to bright and contrast colours. It sure makes playing more fun! Love too, the pieces shaped like that of a hexagon did make thinking out of the box. It allows many possibilities of connecting and involves much thinking on the best method to make their structure firm and steady. With 6 holes on one side and 4 protruding on the other, it sure involves some experiments when building. They then went on to explore making ship, belts, tiara, sword and shield and the endless creations. Beyond bricks and blocks, I do think preschools and homes of today should start exploring toys that have newly evolved with with the elements of creativity and imagination. Toys we choose in the early development years are crucial to a child's learning and development. We do need to choose our toys wisely at times. Miclik is designed in Barcelona and is recommended for ages 3 and above. Adults included, I say. A feel on these pieces, one can tell they are of maximum quality and safety standards. A well done and good finished toy. Stated on its box, it also assured that the toy meets the European and American safety standards. Miclik priced at $49.90 consists of 48 pieces in each box and the educational pack priced at $79.90 consists of 96 pieces. WHERE can you buy them? Discover the infinite possibilities only at Explorer Junior. Explorer Junior was founded in 2012 in the National University of Singapore (NUS) by 3 graduates who share a common interest in the early childhood education scene in Singapore. Love the passion they sow into bringing fun beyond the usual classroom setting! 3. Tag 4 friends responsibly on this Facebook post, whom you think will be keen in this giveaway. Hop over to Lil Blue Bottle to try your luck on the similar giveaway too. This giveaway is closed. We have picked 2 winners. Congrats Robert S and Agnes C! 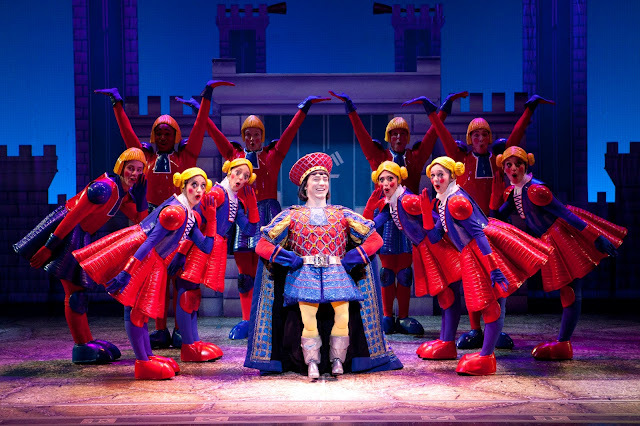 Once upon a time, Musicals drew inspirations from books and plays. It has now evolved to be based on animated movies. 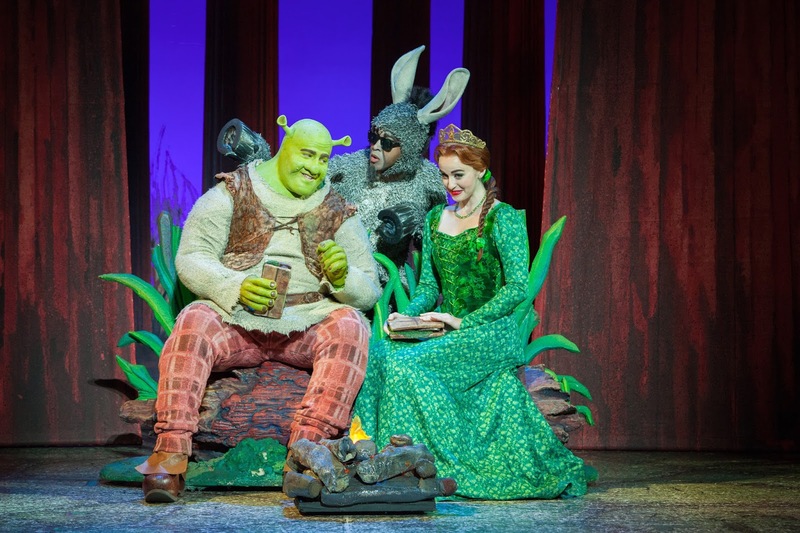 For the first time ever, SHREK The Musical will be performing in Singapore as part of its first international tour. Yay! To the opportunity to catch these well loved characters live on stage. The musical will be staging from 08 June onward, for a limited season. Undoubtedly, Shrek will be a great treat for this upcoming June holiday. This live adaption brings the hilarious story of everyone's favourite ogre to the stage. In a far away kingdom turned upside down, things get ugly when an ogre - not a handsome prince shows up to rescue a feisty princess. Throw in a donkey that does not keep quiet, a villain with a short temper, a cookie with an attitude and over a dozen other fairy tale misfits, and you've got the kind of mess that calls for a real hero. 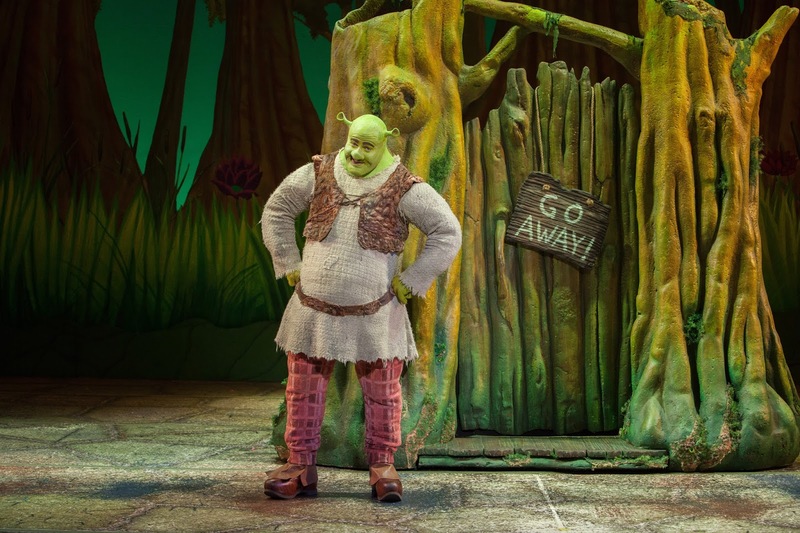 Won't you be so keen to catch SHREK The Musical?!! Join Shrek and his loyal donkey, as they set off on a quest to rescue the beautiful Princess Fiona from the fire breathing, love-sick dragon. It will be one exciting adventure of singing and dancing with the much loved characters live on stage! Jazz loves the Gingerbread man and Jare loves none other than Ogre. Which is your love? Based on the Oscar winning Dreamworks Animation film, SHREKTACULAR or not, you shall decide. Here's one '#LikeShrek' campaign you should not miss to get a Free child ticket. 3. Upon approving your entry, a booking link will be sent to you with which you can get a child ticket free for every adult ticket purchased on MBS ticketing. And here's one to show your child on how Shrek roars. Got it? Capture it and upload it. This Campaign ends on 16 May. Get the camera, lights and action ready! Looking at those green ears he donned on, I'm giving him full score for that roaring effort. Get yours up too! Tickets can be purchased from Marina Bay Sands or Sistic. Disclaimer: Sponsored post. All musical photos are credited to Base entertainment.